Everything is people. It should have been obvious with the way so many disappear and never return. So many lost—grandma, your high school gym teacher, that girl from the news. Why did it take so long to uncover the great conspiracy? Look, it’s simple: everything is people. Hamburgers? People. Milk? People. Cars? People. This is where everyone went when you weren’t looking. Don’t let it change how you feel about sacrifice. It has always been this way. Hot air balloons? Horses? Math? People. People. People. Each life costs something, like a board game where each token is a loved one you must pay back to the world. When you get where you are going, there will be a prize, something, a small silver thimble. You’ll say, Grandma, I always wondered what happened to you. And she’ll say, Child, I was with you all along. And it’s not that she was watching from above—only heaven, science tells us, isn’t people— but that she really was there. Maybe she was your bike or your toaster. Maybe every morning you threw her across the room and your dog brought her back. It doesn’t matter. Everything is people. If it wasn’t her, it was someone else you missed less than they missed you. Nobody’s leaving until this thing is finished and it won’t be finished until one of us has all the bullets. It’s because of that scientist, the one who discovered the way to make everything go on forever is to keep all the bullets from being in the same place at once. Which is why it’s beginning to dawn on us that it’s bad that the thing we are in is a shoot-out, but it’s even worse that we are in it together. To take one for the team, someone says, we have to stop being a team. Someone else says, But there’s no I in team, which is true, but there’s also no you or we or apocalypse or gunfight. If there’s one thing we’re sure of, it’s that the soldiers lining the tops of those towers with their weapons aren’t having a spelling bee. They aren’t thinking of how when we run headfirst against them it’s because we cannot divide ourselves without accidentally saving the world. Some of us know that some of us can’t see where we’re headed, but that’s never stopped us before. None of the ghosts are dead. Because there was never any such thing as dead, which is a relief but only insomuch as we choose not to ask where all the ghosts came from. Which isn’t much of a relief at all, really, but who wants to take that apart. It’s like how some balloons float away and some pop against the ground. Either way they are gone. In our experiments, it doesn’t matter which ones are red and which ones are yellow. The only thing we know for sure is that each lost balloon creates a whaleghost but no whale has ever died. Because there was never any such thing as dead. Maybe it’s that every time we let something slip through our hands, it becomes a ghost. Or maybe ghosts choke on the balloons. Because ghosts die. That’s what taught us the difference between lost and dead. That’s science. And we should never have asked where the ghosts came from because we are out of both balloons and ways to make more of them. We do have these whaleghosts though, and when they haunt the air children lasso them with strings. They might float away or fall to the ground, but they’re not dead because they’re still here. It’s last week the whole time. That’s why there’s a car in the driveway and why it’s morning and why the whole place smells like coffee and all the alarm clocks are about to tell you it’s time to make some of the eggs you bought yesterday at the store just before you stood in the candy aisle debating whether or not to treat yourself to a chocolate bar or if you could just eat the ice cream you’d almost forgotten you were saving for when she’d come over and put herself on your couch and wait for you to bring her things from the freezer which is what she did when she could stand to look at you, and she could then, loved to even, because that hasn’t happened yet. It’s last week but O god look out. The collaboration worked this way: We each wrote first drafts in batches of roughly three at a time, until we had enough pieces for a manuscript. We then divided the whole pile into six batches—half his, half mine—and began revising. The idea was that we’d revise each piece so aggressively that we’d no longer have ownership of the drafts, so each piece did change a fair amount from draft to draft. We sent the batches back and forth to one another six times or so, then reconstituted the manuscript. We can still more or less remember which ones we started, but I don’t think either one of us is really clear anymore on which one of us wrote which parts of which pieces, which was part of the idea. —L.E.E. Laura Eve Engel is the co-author of [Spoiler Alert], forthcoming from The Collagist/Dzanc Books. Her work has recently appeared in or is forthcoming from Denver Quarterly, LIT, Cincinnati Review, Cream City Review, and elsewhere. Adam Peterson is the co-author of [Spoiler Alert], forthcoming from The Collagist/Dzanc Books. His work has recently appeared in or is forthcoming in Southern Review, Alaska Quarterly Review, Camera Obscura, Denver Quarterly, and elsewhere. 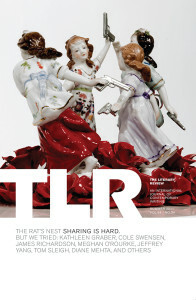 “[Spoiler Alert]” appeared in The Rat’s Nest (TLR Summer, 2011).